As originally feared, MF conditions took a nasty beating this weekend during the monthly CLE . It's really amazing how closely synced to terrible conditions the CLE's have become ... perhaps we need to offset our monthly activity by staging the next one in two weeks to see if we break out of sync with the Sun's regular 27-day rotation of coronal hole streaming. 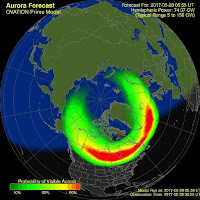 Friday night was the best, much better than most other regions in North America from what I could tell as the geomagnetic storm had not yet struck ... but most others suffered from severe thunderstorm noise further to the south and east of BC. 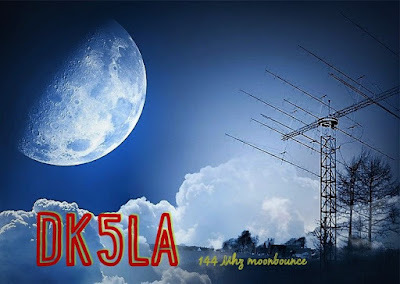 Once the geomagnetic storm was underway, the DST quickly tanked and both Saturday and Sunday nights saw a shroud of absorption thrown over the NDB band, at times making me wonder if I even had an antenna connected to the receiver. I haven't seen such poor conditions on MF in several years. This coming weekend will see another CLE challenge. This time the hunting grounds will be: 350.0 - 369.9 kHz. A nice challenge in this one is to hear the Maniwaki NDB, 'YMW', on 366 kHz. It's a 500-watter and is well heard, having been logged from Europe to Hawaii and is a good propagation indicator for listeners in western North America. Look for 'YMW' on 344.401 kHz. 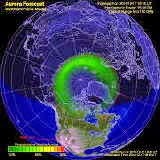 I see a forecast of a possible CME impact sometime Friday, right on schedule for the CLE event! Sometimes these help but usually not. At this time of the year it's usually not the propagation causing problems but rather, the lightning activity and its associated QRN. A good place to check lightning activity in realtime is at the Blitzortung website. When tuning for NDBs, put your receiver in the CW mode and listen for the NDB's CW identifier, repeated every few seconds. With your receiver in the CW mode, listen for U.S. NDB identifiers approximately 1 kHz higher or lower than the published transmitted frequency since these beacons are tone-modulated with a 1020 Hz tone approximately. For example, 'AA' in Fargo, MN, transmits on 365 kHz and its upper sideband CW identifier is tuned at 366.025 kHz while its lower sideband CW ident can be tuned at 363.946 kHz. Its USB tone is actually 1025 Hz while its LSB tone is 1054 Hz. Our 219th Co-ordinated Listening Event is almost here. pleased to help first-time CLE logs through the harvester program. includes 350 kHz but not 370) plus any UNIDs that you come across there. email and not in an attachment, with 'CLE219' at the start of its title. and UTC (the day changes at 00:00 UTC). 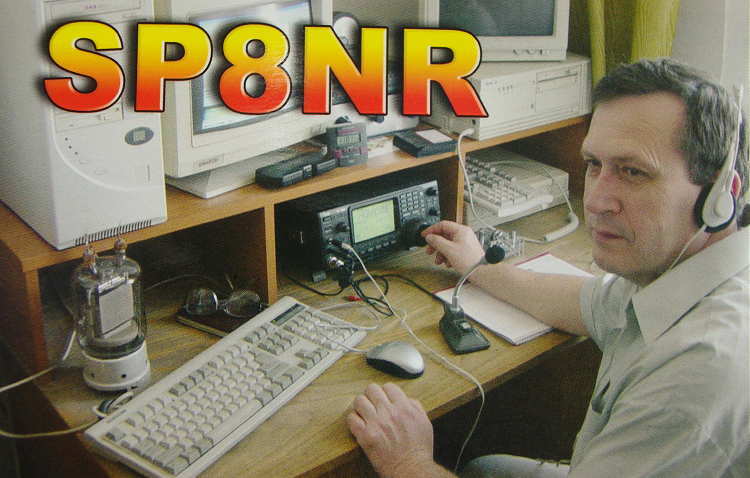 # kHz - the beacon's nominal published frequency, if you know it. Optional details such as Location and Distance go LATER in the same line. If you measure LSB/USB offsets and cycle times they are useful too. receiver, aerial(s) and any recording equipment you were using, etc. so you can check that your log has been found OK.
Wednesday 31 May. I hope to make all the combined results on that day. stating its location and owner - with their permission if required. Sometimes a listener has local problems and can only take part that way. remote, to obtain further loggings for the same CLE). The very active Yahoo ndblist Group is a great place to learn more about the 'Art of NDB DXing' or to meet other listeners in your region. It's also a good place to submit your CLE log! There is a lot of good information available there and new members are always very welcome. As well, you can follow the results of other CLE participants from night to night as propagation is always an active topic of discussion. Mark, VA7MM, has been testing out his newly-acquired MFJ-1026 Noise Canceller and has provided several videos of the noise canceller in action. Like so many other hams, Mark's suburban location has seen a gradually rising noise floor and the noise heard in this video is from an off-site location within his local neighbourhood, located about 400m away. 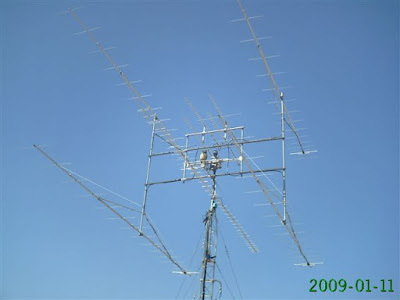 The noise canceller requires a separate 'noise antenna' in order to cancel any noise on the main receiving antenna and for all of the tests shown below, Mark's noise antenna was a Cushcraft R-7 vertical while using an Icom IC-7600 transceiver for listening. Living in the noise cloud one must resort to special measures to use affected portions of spectrum. I recently purchased an MFJ-1026 noise canceller and have been testing the unit and have attached videos demonstrating the unit’s performance. You will see examples of raw noise, SW broadcast and 40 m CW signals with the unit being switched in and out. Also for comparison is the noise blanker in the IC-7600 failing to eliminate the same noise. With proper tuning and set up, it looks like the MFJ-1026 can make a worthwhile improvement in unwanted noise reduction. Mark will also be testing and comparing a Timewave ANC-4 Noise Canceller with the MFJ and any videos received will be published here. My interest of late has been piqued by the ongoing VLF experimental work by several European amateurs. 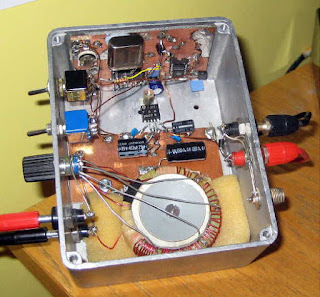 Recalling that Roger, G3XBM, did some VLF experimenting a few years ago, I have been reviewing some of the excellent hands-on information gathered and published in his ham radio blog and to some of his other VLF pages. It's not the first time that I have found project-inspiring reading within Roger's blogs. They really are a treasure-trove of useful information, construction notes and accumulated test data gathered from his methodical approach to so many interesting topics ... experimental amateur radio at its very best. A few years ago I was immediately hooked by his experimental lightwave work, both line-of-sight and clear-air / cloudbounce scatter ... so much so that I also became involved in some lightwave work with other locals who were also inspired by Roger's information, culminating in our own West Coast Lightwave Adventure. 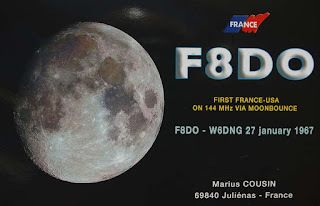 Roger's VLF experiments are also proving hard to resist, especially those of the earth-mode type and I may find myself falling victim to his detailed Sub 9kHz Amateur Radio pages and the Earth Mode pages in particular. It seems that most amateur VLF work is being done in the vicinity of 8kHz since this part of the frequency spectrum is unassigned. I gather that one can conduct earth-mode tests in any portion of the VLF spectrum since no signal is being 'radiated' as is typically done via antennas. Further investigation remains to see if I need a 'developmental licence' to conduct some radiated (non-earth-mode) experiments in the 8kHz range as well. 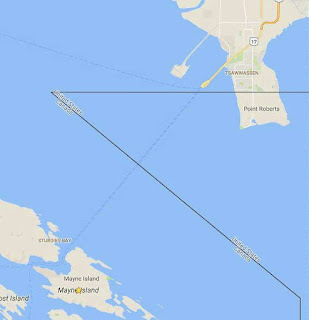 Getting a VLF signal from here on Mayne Island across Georgia Strait via earth-mode or via conventional methods would make an interesting challenge and would certainly result in some new homebrewing opportunities. Here on the island, I often hear audio associated with the container terminal and ship-loading operations near Tsawwassen, directly across the strait from here. I feel that this may be aided somewhat by the solid sandstone of the island being directly connected to the other side, so perhaps an earth-mode system utilizing the ocean as one-leg of a buried loop might be an interesting experiment to tackle ... or groundwave transmissions across the ocean via an antenna, to the other side, providing I could find someone to listen. I see just two Canadian amateurs experimenting on VLF ... VO1NA (Joe) and VA3VVV (John) near Toronto. Any VE3's in the area who are interested in VLF may wish to contact John and exchange notes. He has a Facebook page showing his VLF setup. 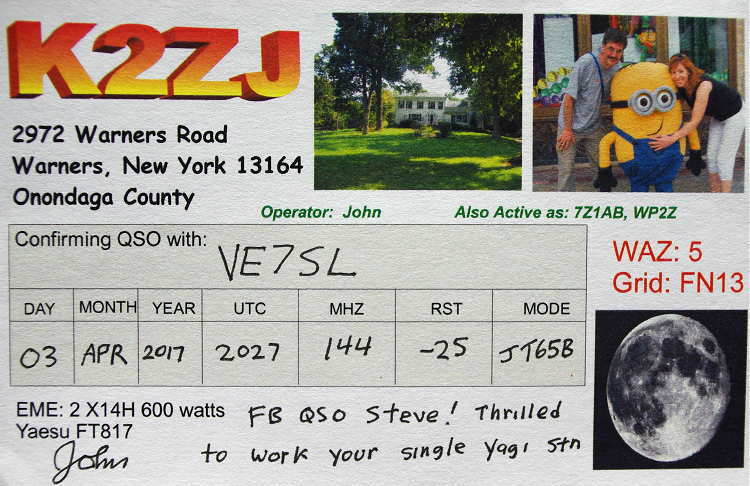 Interestingly, Joe's 30W VLF signal on 8.270 kHz has just crossed the Atlantic! Joe is documenting his VLF experiments here. All of G3XBM's VLF blogs can be downloaded for reading or for printing via this link. Similarly, his lightwave experiments can all be found here ... both links will yield several pages of material if you click on the 'Older Posts' link at the bottom of each page. The best way to follow these is chronologically which requires going all the way to the end of the final 'OlderPost' link and follow along with Roger as he gradually develops, evaluates and improves the gear that he needs to make progress. This is fascinating reading. But be suitably warned ... you may readily fall victim to his experimental work as well and suddenly find yourself with another exciting project! 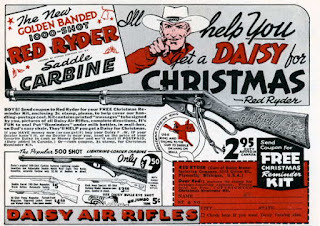 There still seems to be a number of 'big guns' showing up each month, that I have not heard or worked before as well as several 2-Yagi 'little pistols' that I am able to work under very good lunar path conditions. 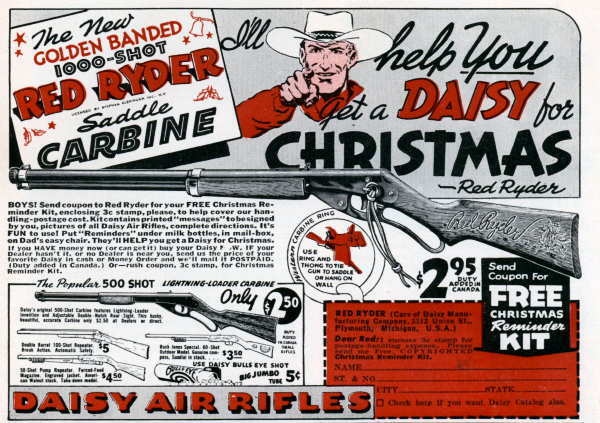 I suspect that having just 1-Yagi puts me in the $2.95 'Red Ryder' category! With the QSL's from last month's surprisingly good EME conditions just starting to arrive, May's moonbounce operation continued to produce good results. Whether this is because of better than normal lunar path conditions or just a result of my neighbour's tree-pruning, remains to be seen. The few days of operating in early May were, as usual, planned to take advantage of the Moon's closest approach as well as the Moon's most northerly declinations. The latter condition puts moonrises directly out in front of the house and looking across Georgia Strait's many miles of saltwater. 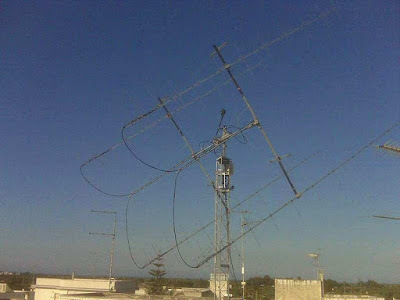 The extra theoretical 'sea-gain' appears to be a reality under these conditions and allows my 9el Yagi to garner another 6db on both transmit and receive paths, making it perform more like a '4-Yagi' array. Eight stations were worked this time around, with six of them being new 'initials', bringing my EME total from 95 to 101. Several of these stations were speaker-audible, at CW levels. DK5LA's cross polarized 8 x 16 array ...very loud! For now, any earlier thoughts of building a 4CX250 300 watt amplifier have been put on hold, while I continue to slowly work my way through what seems a never-ending list of workable stations. A note from Roger, VK4YB of Monitor Sensors, reports some interesting news. 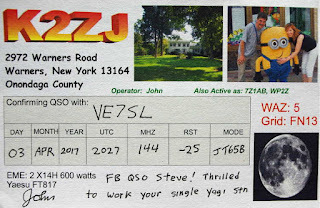 You might recall that his company manufactures a very versatile and well-engineered 630m transverter which was used at both ends of our two 630m JT9 contacts last year during the fall equinox propagation peak between North America and down-under. 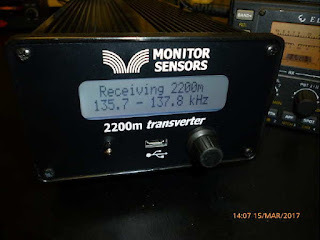 Roger now reports that Monitor Sensors will be producing a new 2200m transverter, with all of the bells and whistles found on the 630m unit which has proven to be a real workhorse. The Monitor Sensors TVTR2 2200m Transverter enables any Amateur Radio Station, equipped with a conventional HF transceiver, immediate, all mode, access to the new 135.7-137.8 kHz, 2200m band. The receiver design incorporates a 7pole Chebyshev filter, 3kHz wide roofing filter and a 5 pole Chebyshev filter in cascade before the double balanced, commutating mixer, fed by an ultra stable, temperature compensated, extremely low phase noise, MEMS local oscillator. The mixer is followed by a Chebychev band pass filter into an ultra linear, low noise, current feedback, IF amplifier. The receiver noise floor, in a 500Hz bandwidth, is -125 dBm and yet the onset of compression is not reached until +11dBm. A front end 20dB attenuator can be switched in for even higher signal handling. Overall receiver gain is set to +6dB, or -14dBm with attenuator in. The transmitter input circuit incorporates a 0-14 dB switched step attenuator to prevent over driving. The same mixer and local oscillator are used on the transmit side. The PA uses 6 rugged lateral FETs in class AB push-pull to easily achieve the 50 watts rated output. Lateral FETs are inherently linear and thermally stable. The transmitter can be run at full power, indefinitely, into a dead short or open circuit without any danger of damaging the FETs. Transmit-receive switching is automatic with user selectable VOX delay. Alternatively the PTT line may be used. The transverter employs extensive and accurate metering. Power input and output, SWR, Frequency, Attenuation in use, Temperature, Supply Voltage, Current and Resistance are displayed. Transmission is inhibited if carrier frequencies outside the 135.7-137.8 kHz band are detected. A tuning screen may be selected which displays SWR in digital and graphical form for easy antenna adjustment. The menu system is self explanatory and users report no manual is needed, although one is supplied. A USB socket is provided for future code upgrades (free of charge) from the Monitor Sensors web site. The transverter has been designed for the best possible protection against accidental mishaps. It will survive reverse polarity supply and the injection of 100 watts of HF into any of its ports whether in transmit or receive mode. If supply current exceeds 25 Amps, the supply is cut in 3 microseconds. This electronic breaker can be reset by simply switching off and on again. The transmitter will shut down in the unlikely event that the internal heat sink reaches 90°C. The cooling fan is under the proportional control of the microcomputer and begins operation above 35°C. Any unusual operation will cause the screen to turn red and an appropriate warning will be displayed. In addition to the transverters, Monitor Sensors will also be manufacturing solid state amplifiers for both the 2200m and 630m bands with power levels at around the 450W output level. Like the transverters, these will be 'linear' devices as well. It is possible that a duo-band amplifier will also eventually be produced. It will be interesting to see if any other new gear becomes commercially available from other manufacturers once the LF / MF ham bands are introduced in the U.S.A. , something that is expected to happen fairly soon.